Other than Lucy, the cat, who helped me get over the brain “silent treatment” Sophie the dog of a mutual friend on Facebook showed me how to relax. We had a fabulous day of relaxation having our facial. I learned a trick from her how to remove the bags from my tired eyes. Cucumber. That is what I call a cool cucumber. It works. Sophie’s motto is “every girl needs to pamper herself.” And did we ever. Pure bliss. 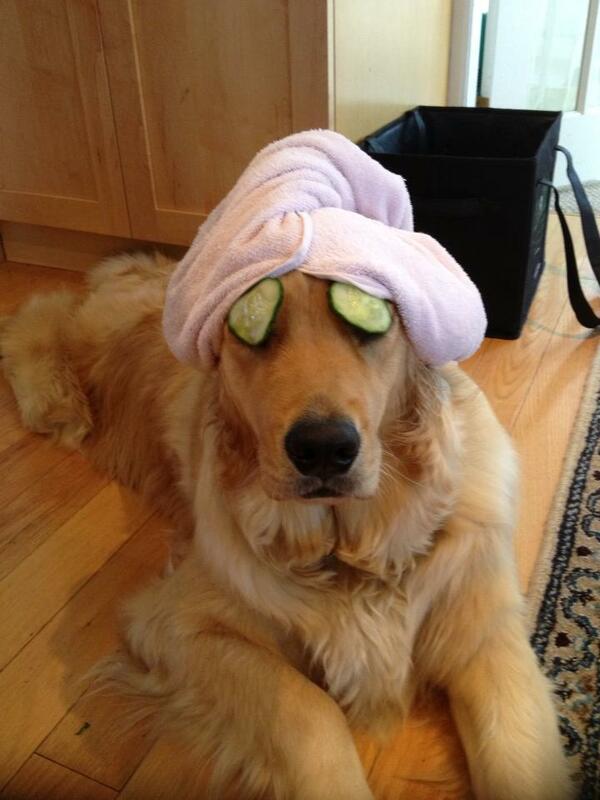 Do you have tricks to share with Sophie how to pamper yourself? This entry was posted in Uncategorized and tagged Animals, Cucumber, Dog, Facebook, Humour, inspiration, Pet, Pictures, postaday by Perpetua. Bookmark the permalink. !!! I say, the cats can do the same, too, you know. That is just awesome. He doesn’t want to give up at all. So sweet and thank you. Poor baby, I wanted to pick him/her up. Bella can join anytime Paulette. Oh la la…. time to go shopping. I think red, pink or blue will be perfect for them nails. Thank you. With somebody else doing the cooking and bringing my food to my lap! I’ve heard that using hemorrhoid cream under your eyes works, too, to get rid of dark eyes. Still, I believe you have the right idea, P! I think I may imitate that this week-end! Hemmo what? That is too funny, Tk.